"There is one God: what need is there to complicate matters? We can learn from our differences and respect each other as fellow human beings." One of our readers sent us a link about Senegelese Abbé Jacques Seck. 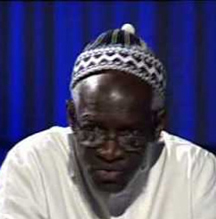 He is an iconic figure in Senegal, a leader within the Catholic Church, and a strong proponent of the interreligious dialogue and harmony for which Senegambia (Senegal and The Gambia) is famous. As an inclusive, diverse, Pan-African magazine, we share this story. I am almost 80-years-old now and have retired! So I do many different things, whatever comes my way. I have been part of the Senegalese Catholic Church all my life and all of my career. I was born in a village into a Christian Serer family. I was raised as a Catholic, but also with animist traditions, and indeed I can say that up to the age of 15-years-old I was really an animist. I did not initially see myself becoming a priest. In fact, I began my career as a primary school teacher. As I got older, however, I realized the Church was my true calling. I went to the seminary at the age of 26-years-old and was ordained in 1969. I was known as the talkative priest because then, as now, I talk a lot! But, even as a Christian, interreligious relations were part of my life from the start. My sister is married to an imam, and there are many other interreligious connections within my family and community. My nephew teaches Arabic at a daara (Muslim school). It is completely natural to have these different religious traditions in a Senegalese family. I have given money to family members to make the pilgrimage to Mecca, and they have helped in similar ways. Intermarriage is quite normal. We know one another from work in the fields and every other part of life. We grow the same crops and keep the same animals on the same land.